Home» Road Tests » Mercedes B-Class Contract Hire & Leasing Review. Mercedes B-Class – Gonna Get It Right This Time? Its fair to say that Mercedes first go at making a front wheel drive vehicle wasn’t a raving success. The very upright A-Class of 1997 abysmally failed what’s known as the ‘elk test’ which called on a car to be able to complete a really fast lane change (to avoid the elk, I guess) but because the A-Class nearly turned over at each attempt which meant that the car lost all credibility and that “Elks” all over the world were frightened to go outside! This was a major embarrassment to Mercedes, and they pulled the A-Class from sale, recalled the 2600 units they had already sold, got their tech guys to mess with their suspension, fitted them with electronic stability control, slapped them on the bottom, then sent it back to their owners and put new ones on the shelf for Joe public to buy. Well, buy it we did, but not in large numbers as it didn’t feel like a Mercedes, it felt cheap and to be fair, it looked cheap, and what ever your perception of the age group of a typical Mercedes buyer, the A-Class was realistically only an object of desire for those returning from a Saga holiday, or for those with a pension lump sum which they could fritter away on something really silly. Mercedes had already spent a fortune on producing this new sophisticated front wheel drive chassis for the A-Class, so weren’t about to give up and throw all that expensive development in the trash can and fancying another bite of the knackwurst, in 2005, they released another vehicle on the same platform, which they called the B-Class, which in simple terms, was effectively, a bigger version of the A-Class. Billed as “compact sports tourer ” the B-Class was launched in 2005 and we tested the car way back then and disliked it that much that we felt we shouldn’t write a road-test on it for fear of being taken to Stuttgart and forced to spend our lives eating Sauerkraut and listening to Oom-Pah music. Even after the 2008 facelift, we still didn’t like the car and still didn’t like Sauerkraut, so we kept silent! However, things have changed, there is a completely new B-Class Mercedes and gone is the overly complicated sandwich floor chassis and in its place is a new, state of the art, modern chassis that Mercedes intend to use for a number of cars in their future line-up, including the new A-Class and possibly a new MPV and a new Coupe at some point. Mercedes were kind enough (or brave enough) to loan us one of the first B-Class in the UK to see if this time round, we were able to put something on paper that wouldn’t see us exiled and clearly, as you’re reading this now, the answers has obviously been yes. The B-Class is an “all-new” car, from the ground-up its not a facelift or a tweak, its “all-new” although, to be fair, its still instantly recognizable as a B-Class Mercedes, and that’s why I am emphasising that this is a different car, as it looks a lot like the old car. OK, it’s sharper, its lower, its more dynamic but to be fair, its styling is more evolution than revolution and buyers of the old car will feel at home with it. However, Mercedes have pulled off a magic trick as they’ve managed to “un-frump” the B-Class, taking years of its image and I would suggest, years off the age of the typical B-Class buyer. So, on the outside, its still a B-Class, but its a sharp one and to highlight that, our car came with a big fat set of 18” alloys as standard, really cool looking daytime running lights, dark tints and an enormous “look at my badge” star on the front grille. The only thing that we didn’t like was the drab colour our loan car was in, but as we got friends with the B-Class it didn’t seem to matter. We didn’t however know where to put the B-Class in terms of comparison, as Mercedes say it’s a “Sports Tourer” but for us, it doesn’t look like an estate car and it doesn’t look like a big hatch either, so we asked around the office and overwhelmingly, people saw it as an MPV, albeit a fairly sporty & posh MPV, but an MPV never the less. So going from this straw poll, and despite Mercedes saying that Audi A3, BMW 1 Series and Golf, were its competitors, we saw it more like a posh Ford C-Max and frankly, thought Mercedes were doing the new car down a bit by choosing the less practical cars it did as competitors as the B-Class is a far more practical and useable car than the A3, Golf or 1 Series. The good impressions of the cars exterior carry on inside the car and our car was a looker, of that there is no doubt. Our B-Class was the Sport edition but it was fitted with a few extras, not least of which was the most gorgeous beige leather interior, which with its black highlights which was simply stunning. The cars dashboard with 3 large round vents in the centre looked just so much more modern than other Mercedes we have tried (even other modern Merc’s) and pride of place hovering in the centre of the dash was a really cool looking TFT display screen which looked very similar to a new I-Pad and depending on version, came with either 5.8inch or 7inch screen. On our car we had the 7inch version and it housed the superb Mercedes COMAND system which on our car was an “online version” providing Navigation, and a 10gb space for storing your MP3 audio library in the car, plus all the other normal Radio, CD and DVD features and controls. We of course understand that the cost of COMAND Online is an awful lot at £2300, but If you can afford the extra, it’s a great bit of kit and lets face it, if you are going to keep your new B-Class for say 3 years, it only works out at £2 a day and to me that seems a bargain, especially as when you sell your B-Class in 3 years time, its going to be worth a fair bit more and don’t forget, a buyer looking for a used B-Class is going to think he’s struck gold compared to other used B-Class and its going to be your car that sells the quickest, so maybe the £2300 isn’t such a bad investment after all. The cars switchgear was precise and nice to use, but why oh why do Mercedes insist on putting so many operations on one stalk, when there is space for another as that’s going to put buyers off at “test drive” level because it takes a while to get comfortable with it. The steering wheel controls were intuitive and located nicely and the cars Instrumentation was clear and concise and as with most Mercedes we’ve tested recently, the car had the retro radio tuner, which is really quite nice, kind of like tuning in an old 20’s valve radio, although after a while, you do begin to think it’s pointless and hunger for some simple numbers. Pleasingly, the awful Mercedes hand/foot brake (which only Mercedes drivers like) has gone and been replaced by a modern slick electronic device, although its still up to the driver to put the brake on or off, unlike other cars where the system works automatically, coming off when you pull away and going on when the cars ignition is turned off. (The Peugeot 508 I am driving at the moment does just that). Before we leave the cars interior, we have to comment on the cars ambient lighting which made the car a really nice place to be at night and apparently, its all part of something Mercedes call “Sight & Light” which helps you see better at night because of the ambient lighting, but it included illuminated foot wells, dashboard, door trim and door handles and for safety sake, warning lights on the front doors and tailgate. Specification wise, the B-Class comes in just 2 flavours, the SE and the Sport. Model designations are B180 or B200 and of course, amongst that, there are diesel or petrol choices, all of which are badged “BlueEFFICIENCY”. Everything is 4 cylinders and everything is turbo-charged. The petrol units are just 1.6-litre and produce 122hp in the B180 versions and 156hp in the B200 versions. Diesels are 1.8-litre and a 109hp version finds its way into the B180, whilst the 136hp is reserved for the B200. Choices of transmission are a 6 speed manual or a sophisticated 7G-DCT 7 speed dual clutch automatic which cleverly helps the car to deliver manual transmission Co2 figures and fuel economy. Prices start from £21,290 on the road for the B180 1.6 SE, up to £26,160 for the B200CDI Automatic, so sits well alongside its ‘posh badge’ competition, but a quick look through the price list reveals that you could quite easily pay another £6,000 plus for extras, as even on the top ‘Sport’ model, adding an exclusive pack costs £1,055 and if you fancy the “lane-tracking package”, that’s a further £785, cruise will cost you a couple of hundred pounds, whilst an “intelligent Light System” that’s going to be £580, whilst if you fancy a “Panoramic Roof” that’s going to hit you £1195 and Mercedes version of Sat Nav, called COMAND, well that can set you back up to £2,300 and of course, “Metallic Paint” well that’s £515, and that’s only a sample of the extras available, so you could easily end up paying £32,000 for you B-Class and that’s one heck of a lot of money. On the road, the new B-Class was quiet and refined, but then, that’s no more than you expect from Mercedes. Our car had the 136hp diesel and even from low revs, the car pulled well and on our regular 25 mile commute we were able to overtake and do all the things we could in even more powerful diesel vehicles, so much so, that the engine really didn’t take much of our intention, because it did everything well, its only when things struggle, or don’t work so well, we tend to complain, so I guess its full marks in the engine suits the car category. Because of the different way we drove the car during our tests, we didn’t achieve the mpg figures claimed by Mercedes, however our car had a declared combined average of 64.2mpg and we did easily get into the low 50’s area, so chances are, driven properly we could achieve the mercedes figures. Across the range, Mercedes say that combined mpg figures run from 45.6mpg for an auto B200 with the petrol unit, up to 64.2mpg for any and all of the diesel motors. Co2 ranges from 145g/km down to 115g/km depending on the model you choose, so again, the car is there or there about. The B-Class steering however did surprise us, as apart from providing plenty of genuine feedback, for a front wheel drive vehicle, the B-Class turning circle was just 11 meters and that’s really noticeable when manoeuvring and yes, we liked that. In terms of safety, Mercedes have gone overboard and every B-Class gets “Attention Assist” which monitors the drivers behaviour via an array of sensors and registers unexpected changes that may indicate drowsiness or lapse of concentration, then warns the driver with visual and acoustic warnings, that its time to take a break. Not happy with just that, Mercedes also includes a radar-assisted system called “Collision Prevention Assist” which alerts the driver if the distance to the vehicle in front decreases with unusual rapidity, to help avoid running into the back of the vehicle in front. The system also used ‘Adaptive Brake Assist’ function to automatically increase the force of your braking if necessary to increase your chances of avoiding impact. These systems are standard across all B-Class models. If you feel you need to be even safer, you can also opt for ‘Lane-Keeping Assist’, ‘Blind Spot Assist’, Distronic Plus, and ‘Intelligent Light System’ and these are just a few of the safety options available. In summary, we’ve told you we didn’t like the original A-Class and that its bigger brother the B-Class was an awful thing when it came out in 2005, so we were a touch pensive about what we would find in the B-Class replacement. Truth is, we shouldn’t have worried, because this is an all-new car and it puts Mercedes firmly back in contention in this sector (what ever sector it might be) and the B-Class is a car you’re going to be happy with if you were given one as a company car and it’s a car you’d be happy to spend your own hard earned cash on if you’re one of those unlucky people who have to buy your own wheels! The only problem I can see for Mercedes is dragging in new buyers and getting drivers to look at the B-Class again, or perhaps for the first time, as the old car wasn’t a cool car to own or even be seen in, but the new one will be as its so much sharper, trendier and up-market than the old B-Class “its not frumpy anymore”. In some ways, it may have been better if Mercedes called this new car something different, especially as it is all new and especially as its potential driver has become younger, but fact is that many drivers loved their old B-Class Mercedes and are going to want to replace it with another one and this makes it easy to keep them true to the badge. Despite all of the hype that surrounds the new car and people saying where it sits in the market and what its competition, well for us, we see it more Ford C-Max than VW Golf, Audi A3 or BMW 1 Series and so from that, I guess effectively, the B-Class is like a C-Max with a posh badge. Don’t for one minute think our saying this is an insult or a slight aimed at the Mercedes, because its not, and it couldn’t be further from the truth. The Ford C-Max is a stunning car that does everything very well and fact is, the old B-Class wasn’t even in the same league, so it shows you just how far Mercedes have actually come with this new car by being able to compete head to head with the Ford C-Max. So think of this as a compliment to the B-Class and lets get real, because what’s considered to be the ordinary everyday cars such as Ford, Vauxhall, Peugeot etc are fantastic things, but being what we are, if we can afford a “posh” badge, we are mostly prepared to pay extra to get one. Often people just buy the badge, irrespective of the product, but the point I am trying to make here is that with the B-Class Mercedes, you wouldn’t be just buying a posh badge, but a great car also. 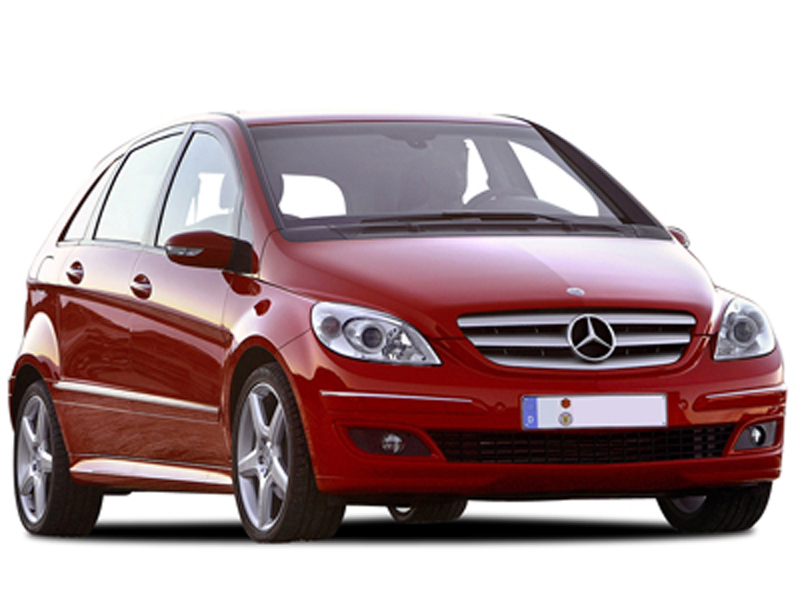 For a quotation on the new Mercedes B-Class or on any other Mercedes, please contact us.